10% discount when you register for more than 2 weeks via weekly session. Discounts included in daily rate. Discounts taken automatically at check-out. Early Birdies: $110 per week. Register for more than 3 weeks and receive 10% discount. Birdies: $160 per week. Register for more than 3 weeks and receive 10% discount. Early Birdies: $250 per week. Register for more than 3 weeks and receive 10% discount. Birdies: $250 per week. Register for more than 3 weeks and receive 10% discount. Rain Location for Central Park Met location is pending at this time. KTUGA reserves the right to cancel classes with less than minimum registration of four students. -Programming is restricted this summer as we are welcoming a new baby birdie to the team early July! -Enrollment in Golf Swim & Golf is limited this summer. -Evening Eagles is only running on Mondays & Tuesdays. -Day Eagles is not running. 9:30 to 10:00 Group activity and warm up. Rain or Shine. Arts & Crafts and indoor golf and games will take place during inclement weather. Register for as little as one day a week or all five days a week. 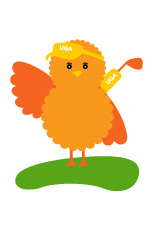 5:30-7:30 On course play with coach supervision. LIMITED TO 6 golfers per week. +Camp is open on July 4th!